What is done with donated furniture and appliances? All donated furniture is placed for sale at our store. We are connected with local churches, Neighbourlink, the vernon Women’s Transition House Society, the John Howard Society, NOYFSS, and others where we donate 10% of our furniture back to the local community to those that are in need. What types of donated furniture and appliances are needed? We accept most good quality furniture and appliances. We can’t accept furniture from a smoker’s house, or furniture that has animal markings on it (hair or stains). Appliances must be in good working condition, and mattresses must be relatively new with no stains or tears on them (we always inspect for bed bugs). Where does the furniture and appliances come from? We receive donated furniture from private donors throughout the North Okanagan. We also receive items from local furniture businesses. Why should people donate their furniture and appliances? The finances generated through the store help the other North Okanagan Valley Gleaners ministries. Every $100 of donated furniture produces 5000 meals for the starving around the world. Also, supporting our ministry is being a steward of the environment, helping save a great number of items that would otherwise be sent to the landfill. In addition to these reasons, donating to our ministry can be much more convenient. We have the means and the connections to move the donations efficiently, while selling privately can be a lot of work, with sometimes little reward. How does the furniture ministry help the community? Well, we may not be able to find housing for the homeless, but we can help furnish it (next step). Closed on all stat holidays and the accompanying Saturday. Who can volunteer with the furniture and appliances ministry? Our team has a wide array of volunteers, and each brings special skills. 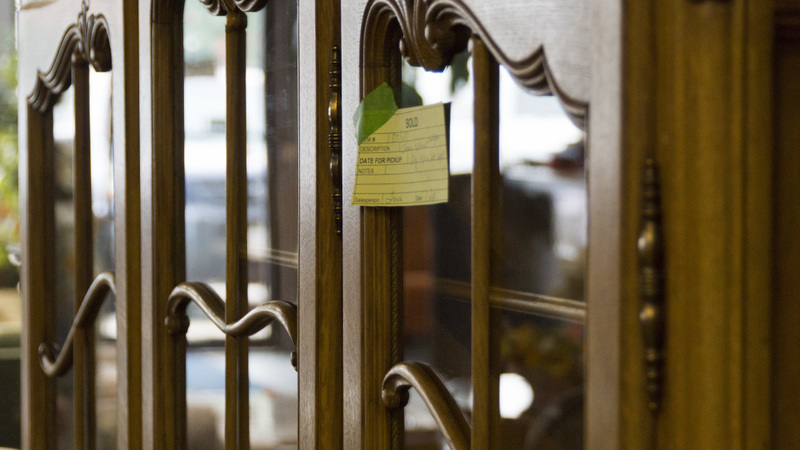 We have a place for you whether it is in the store selling furniture, operating the till, cleaning items, or part of our fix-and-repair team. We also always have a need of people that can assist in lifting furniture. If none of these items is right for you, there is a plethora of opportunities at our plant as well. Why do people volunteer with the furniture and appliances ministry? How can people get involved in this ministry? How do I donate my furniture and appliances? We have several ways to receive your donation. For single items we ask for you to bring it directly to the store. For large items or multiple items, call us at 250-549-1123 for us to organize pick-up or click HERE (link to form) to fill out a form. Please be patient, as our schedule is often up to 3 weeks delayed as we have several areas of the North Okanagan to pick up. What condition of items are required? We accept all sorts of furniture relative to sellability. We often need to actually see the item for determination. Clean quality furniture that is not worn is a wonderful thing to have donated but this isn’t always reality. For example, if a chest is worn out and full of rocks we will have to refuse it. However, if it is full of gold we will be happy to receive it! How do I know if the donation will be accepted, before I transport it there? When are donations needed throughout the year? What types of furniture and appliance donations are needed? We look for all sorts of larger items in the house. We do not accept renovation items or smaller knick-knacks.